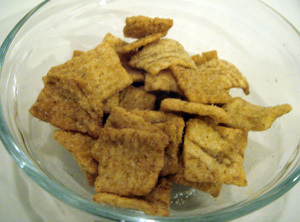 I LOVED Cinnamon Toast Crunch growing up. I haven’t had it in forever (like so many things on this blog) and I know, comparing toast to buns might not be fair, but I was excited to see Cinnabon cereal and figured it was still a formidable opponent. I’ve never had Cinnabon cinnamon bun, I feel like they should have them in New England but I rarely get to a mall so I just haven’t been around to try them. CTC is just like I remembered it, delightfully crisp and light yet amazingly crunchy. It has the perfect amount of cinnamon and sugar and kind of a buttery taste. As an adult, I like that the ingredient list is relatively small for cereal and there;s no partially hydrogenated oil. These had a much puffier texture yet maybe a little less crunch – though not to say they weren’t satisfyingly crunchy. 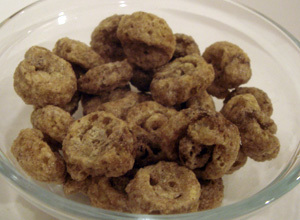 It’s just that CTC is so crunchy that it’s crisp like, these were more of a hollow crunch. That being said, they were airy but still has substantial flavor. Maybe a little more cinnamony than CTC. Of course there is PHO (partially hydrogenated oil) but they do also mention it’s a multi-grain cereal- does that cancel out the badness of the PHO? I’ll go with Cinnamon Toast Crunch because I love it so much and the absence of PHO but it’s just a great cereal. I will say though that I enjoyed the Cinnabons more than I thought I would but given a choice, I’d stick with CTC. 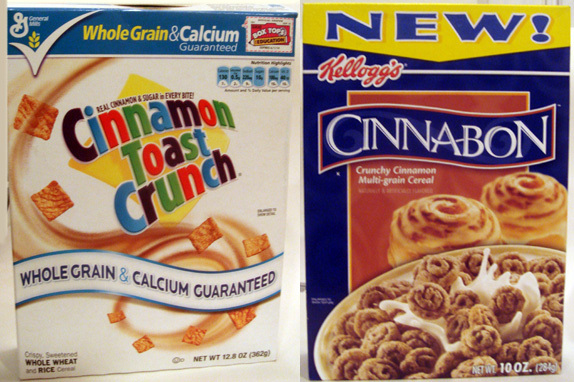 Cinnamon Toast Crunch or Cinnabon?